Limestone covers a family of stone where calcite is the principal ingredient. In its crystalline form it is marble, of which one variety is known to the snuff-bottle collector as aragonite, while in its sedimentary form it acquires all sorts of different names. As a rule, snuff-bottle collectors tend to refer to most of this material as fossilized coral, which much of it probably is. The structure here would certainly be consistent with coral fossils . 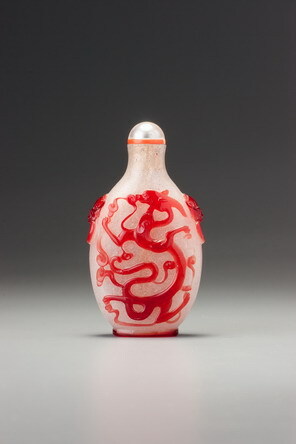 The stone was, we think, indigenous to China and probably available from at least the eighteenth century onwards, although it is another material that is so rarely found outside of snuff bottles that it must owe its popularity to this Qing art form. As far as we know, nothing predating the Qing period is known from the stone, although its softness and fragility might mitigate against an extant body of works surviving from the Ming or earlier, assuming they were rare to begin with.